Since the hoiday season is over, I feel no guilt what so ever about posting this. Mostly because the girls have already gotten the presents that I am refering too. This is an actual text message conversation between Bear and I. To set the stage, I am out shopping for presents and he is at home with the kids. Me: LOL I am officially a real mom now. Bear: How did you find out I was pregnant?!? Me: Butthead! I meant I just bought underwear as a present for the girls. Bear: LOL Yep, that seals it. The first post I ever read on Goodfatherblog was his first Spin Cycle entry “Nothing to Fear”. I must admit I only clicked on the link becase he was a daddy blogger on the Spin Cycle . Since there are so few daddy blogger out there, I had to check him out. What I found was a snarky, creative guy who fears clowns and their trainers as much as I do. But, I also found an honest man doing his best to be a good father. In his blog interview on SixFeetUnder he told us that “Trying to be a ‘good’ father is important to me, although naming my blog ‘GoodFatherblog’ was meant as a reminder to myself more than anything.” Reading that interview is what really got me hooked. 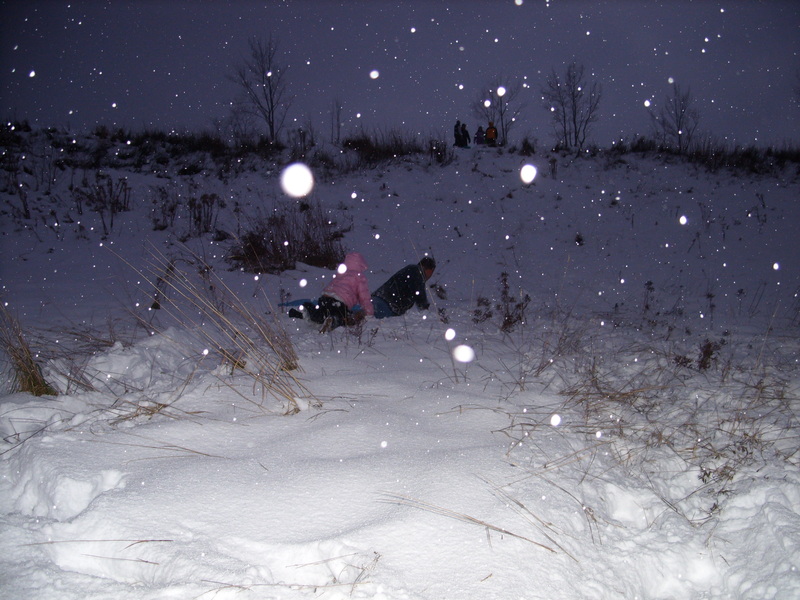 Loser – Because snow angels ROCK! Make sure you leave GoodFather lots of comments because he loves comments!! For the last few years, The Mother Hen has been involved in her school’s chorus classes. They perform two concerts a year and I always look forward to it. This year, The Show was finally able to participate in chorus and we were able to go to her very first concert. The Show is in middle school and The Mother Hen is in high school, so their concerts were a week apart. Due to circumstance beyond our control, The Mother Hen did not make it to her concert this year. Both girls love to sing and will often burst into song when they feel like singing. It is something like living in a musical. Bear always smiles when they do, and so do I. Their faces light up whenever they sing, even if it is just a warm up. When we are in the car, I will purposely try to find songs that they like to sing along to, just so I can see their faces light up like that. The Show’s concert was very similar in format to the Mother Hen’s previous concerts. They entered the stage wearing the now familiar school polo shirts and khaki pants. But, one thing really stood out. The Show was dead center right where everyone could see her. When they began to sing, she began to smile. The Mother Hen always hides in the back and doesn’t start smiling until half way through their first song. The Show even announce a song and played the tambourine right in front. She smiled the whole time. It reminded me so much of the pure joy that comes across the Mother Hen’s face when she sings. Watching them perform is like magic. You can see into their hearts and know that in those few moments, they are truly happy and at peace. They have different ways of dealing with the world and voices that carry their hearts and spirits. I will always love to hear them sing. Okay, so I was going to write something serious tonight. But, I just can’t seem to do it now. So, I will leave you with this. Because it made me laugh when I needed a good one. A little while ago, I learned that my ex was re-married and has a step-son. When I told Bear and some of my close friends, they all wanted to know if I was okay. I think part of it was that the woman he married was someone that caused problems early in our relationship. I think another part of it was they really thought that it would hurt my feelings. I appreciated their concern for me, but honestly, I felt nothing. The woman that he married was someone that he dated for a while in high school. She was around a lot in the beginning of our relationship and often spent time with his mother, even in the later parts of our marriage. At one point, I even asked my best friend if he thought that my ex was cheating on me with this woman. At first, I was thinking that I was feeling nothing because of shock. I thought that if I gave it a few days, things would set in and I would have feelings to deal with. But it has been a few weeks and still I don’t really feel anything. Relief is about all I can feel about it. Relief that he won’t come back into my world out of the blue and demand something of me. In the very beginning of my divorce and my life shortly after it, I thought that he might. I was haunted by the idea because I really thought that he would show up just to cause trouble. After a few months, things settled down in my life and I stopped worrying about it. I was a lot stronger after being away from him for so long and day by day I was getting stronger still. Back to the real me, and who I am suppose to be. I always thought that if he did show up, I was strong enough to handle it. But, when I heard that he was re-married, I let it go. Today, it was brought up in conversation. The person I was talking to said “Sometimes, I wonder about him and his new family. I worry about that kid, because I know what he was like.” I guess I never really thought about that part of it. Is he treating his new wife and son the way he treated me? Is he treating them better because he learned something? Was he only like that because it was me? And honestly, I still can’t bring myself to care that much about his new wife and son. It may be bitterness but I don’t really think so. I also know I have a limited amount of energy. I guess I feel that it is not worth the energy that I have. I would rather use my energy to lift someone up then worry about some child I have never met. If I were a better person, maybe I would worry about this child and the starving children around the world. But, that is not who I am. I worry about the people I care about and let the rest fall where it may. It is strange for me to think about what I did before blogging. But I know I had a life outside of blogging before Life and Times of a Wicked Step Mom was created. It was only 9 months ago that I started writing like this. Now, I can not imagine life without it. To explain how it started, I have to tell you about what came before, about what led me here. As I mentioned before, I am a geek. I used to spend a lot of time reading online forums for rpgs, comics and video games. I spend more time reading blogs now but then I never really use to read them. I was still new at the step-mom gig and feeling really out of my element. I started using google reader to organize my sites. I needed to be able to sort through everything quickly so that I could get the most out of my lunch hour on the web. When setting it up, it gave me the option to include feeds from different categories of interest. I selected parenting, among many others, as one of my interests. If you ask me now why I did it, I can’t really give you a straight answer. I guess I thought that I could subscribe to a few feeds and get some sort of child-raising manual. Something that would help me to figure out the best way to handle my new role. I really was just starting to spend time with the Tribe as a whole and now just Bear. The girls were past the full on hate phase and were ready to accept me, kind of, anyway. The feeds that I found were Dad Gone Mad, Fussy, and a few others. I started reading them and found relief as well as wisdom. I found that others were facing the same challenges that I was facing. The challenges weren’t step-children challenges, they were just kid challenges. I lurked for a long time. I even started sharing some of the entries with Bear. I continued to lurk and found even more blogs that I liked to read. Finally, Bear said to me one day after looking over my shoulder as I was reading a blog, “You could do that.” It was very matter of fact and I knew that he meant it. I started to think about it. I had always loved to write and tell stories. I was nervous because it had been so long since I had written something real. Finally, I decided to take the plunge. I chose to name my blog Life and Times of a Wicked Step Mom because one of my girls was convinced that I was wicked in the beginning. We have a great relationship now, and it is a joke to us. I also wanted to write about what being a step mom was to me and how it changed my life. It changed how I looked at the world and it changed how I feel about myself. First, I want to thank you all for de-lurking and showing your support over my recent crisis. It really helped to know that other people out there have faced the same kinds of things that I was going through. I also found some really great blogs that I have started reading because of your comments. I can not express how much your support has gotten me through the self doubt. Writing again is also thanks, in no small part to Bear. I don’t think I could have gotten back to it without him. Now that the mushy stuff is out of the way, I wanted to share this story with you. As we were driving home from Up North (yes, it is a destination and vacation spot for Michiganders), we found a great radio station on my new satellite radio that came equipped on my new car. It is called Hair Nation and it is awesome. For those of you who do not know, there is a 10 year age gap between Bear and I. The fact that we listen to the same kind of 80s rock has always been a point of amusement between us. All through out the ride, we were singing along to some really good tunes that we haven’t heard in ages. So, I am having a little crisis of faith. I feel like I can’t write. Not that I don’t have anything to write about but that I can’t. I managed to hurt someone with my writing, again! And I am now scared to write. I am afraid of hurting someone but I am also afraid of what not writing means. I took a break over the last few days from reading blogs and from even thinking about writing. It left me feeling empty. Empty from the joy of working on a blog entry. Empty from the charge that I get from writing. So, now, I am not sure what to do. I mean, I have finally started opening up again and finally started really writing again and now I am scared. Anyone else out there ever have this problem? How did you get past it? This week’s spin cycle is a holiday news letter. Since I have never received one or written one, I hope you guys don’t mind that fact that is a little short.. This past year has been a really crazy one. We have traveled up north quite a bit and have had tons of things going on. The Mother Hen started high school this year and is doing well. She is in chorus again and we are looking forward to her concert. The Show has joined chorus this year and her concert is coming up soon as well. This is the first year that The Show has been in a school all by herself. She was a little nervous at first but seems to be doing well without her sisters around. The Tyrant is rocking the second grade. She is reading very well and is asking tons of questions about what words mean and how things work. I am very glad for her curiosity. Both The Show and The Tyrant are growing faster than we can keep them in clothes! Bear and I are doing well with work. Not too much has changed for us. But, I think we prefer it that way. We hope you and your family are doing well. Enjoy the holidays! The Mother Hen has always struggled with athletic tasks. She is built like her father with large Irish legs. When she tries to run or climb, her large legs make her awkward. I think that she always compares herself to her younger sisters who are both built like bean poles and while still clumsy sometimes, tend to be more athletic. She always makes her self feel like less because they make things look easy. As we climbed, I could tell that she was tiring. So, I suggested that we take a short break. She looked relieved as we both plopped down in the snow. After about 5 minites, I said “We are most of the way there, we are going down this hill.” She nodded and smiled before standing back up. On we climbed, the going was slow because the ground was very uneven. But, we continued and finally caught up to the others, who were sitting in the snow and looking very tired. Everyone took a trip down, I went down with the Mother Hen. The Show and her aunt went down. Bear and The Tyrant were quick to follow. When we all made it down, The Show and The Tyrant started the climb back up. The Mother Hen asked me to go with her. I decided because honestly, the trip wore me out. As the Mother Hen started to long climb back up, she started to slip. She was wearing dress boots, not snow boots. And the ground was really uneven. As you can see, it was not an easy climb, even with the right boots. So, she struggled. She was about half way up when Bear looked at me and said, “She is making it up this hill.” He started climbing up after her. When he made it to her, she was still slipping and sliding all over the place. They started to climb up together and I start shouting encouragements. I thought I had shouted myself hoarse. They were about a foot from the top when her aunt said, “[Husband] go down there and help [Bear] pull her up!” I started shouting again, “No! No way! She has gone this far, let her finish!” It took another ten minutes but she finally made it to the top. I have never seen her look so happy or so proud of herself. She conquered the mountain and her own self-doubt.